Air Navigation Pro comes with numerous features both for Android and iOS. Among its more popular and most used features are the moving map, live tracking, route planning, and 3D synthetic vision to name a few. Aside from that, the app comes with lesser known features that you may be missing. Together, let’s unlock some of the features of Air Navigation Pro iOS that you should try out on your next flight. Information is power. This is especially true when it comes to flight safety—having the right data that will help you maintain your situational awareness is of paramount importance. That information is only a piece of the safety puzzle; communicating with other airspace users is equally important. We all share the same sky, and it is a lot safer when you’re more aware what everyone is doing. 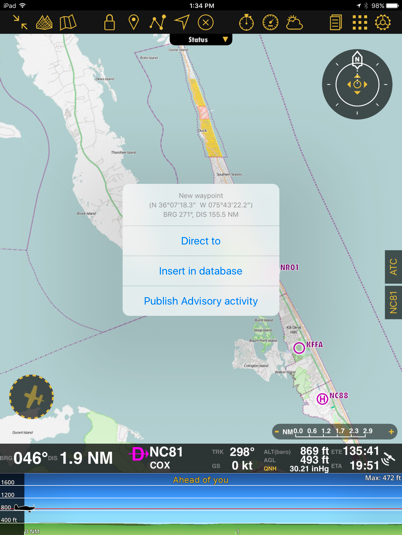 That is why the ability to publish advisory activities with Air Navigation Pro is so powerful. With it, you can communicate the location and altitude you’ll be operating with other Air Navigation Pro users. With a long tap on your iOS screen, it will enable you to select the publish advisory activity option. You can set an operating radius, the maximum altitude you’ll be flying (in AGL or MSL), and the beginning and end times of your activity. You can even select the type of activity you’ll be engaging in; whether you’re yanking and banking in the aerobatic box, lifting loads with a helicopter, operating your drone, or riding the thermals on your glider, you can make sure that other pilots are as aware of you as you are of them. This is just one way that flying is safer with Air Navigation Pro. Norway presents some of the most challenging flying on earth; with the high terrain, deep fjords, remote locations, and some of the wildest weather on the planet. At the same time, power lines pose as an obstacle that is quite difficult to see and avoid. For all pilots and drone operators—helicopter pilots especially, maintaining a clear view of terrain and obstacles is critical to completing missions safely. 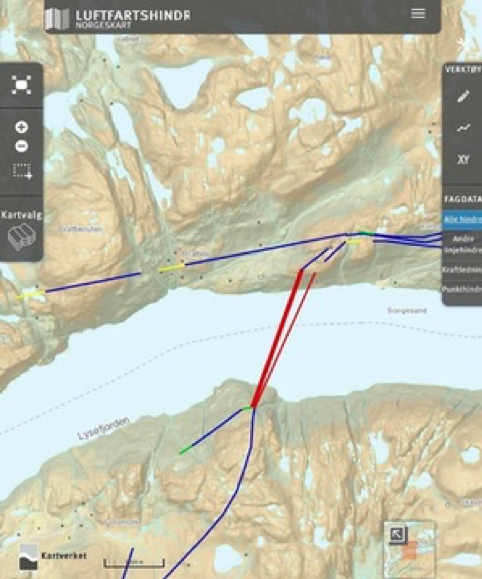 With Air Navigation Pro’s advanced power line drawing feature, that can be easily avoided. To access the advanced power line drawing feature, tap the map options icon at the top of your screen. After, tap obstacles to turn the color coded power lines display on or off by tapping on the slider. You can even set the power line display thresholds to suit your needs by setting to the lowest (green) and highest (red) power line structures that you want to view. The height range in between the user selected green and red values will automatically show in yellow. The power lines shown as blue are those of unknown height since the surveyed height of these obstacles is not known. You can’t configure the height threshold for any power line that shows as blue. Once you’ve selected the advanced power line drawing feature to on and selected your user defined height thresholds, the power lines will be displayed on your map. Power lines that reach the height that you’ve selected for your ‘red’ threshold will appear as zigzags for added awareness. 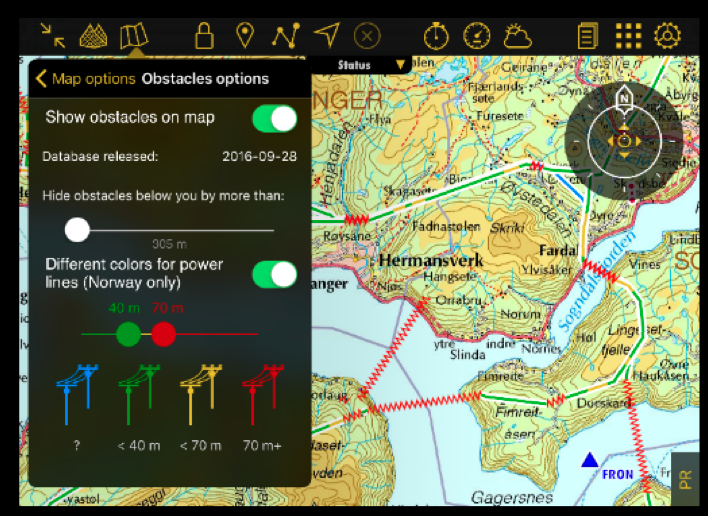 It is important to note that the advanced power line drawing feature is only available with the purchase of the obstacles database subscription. Visit the Air Navigation Pro Map Store and try out this powerful safety tool today. 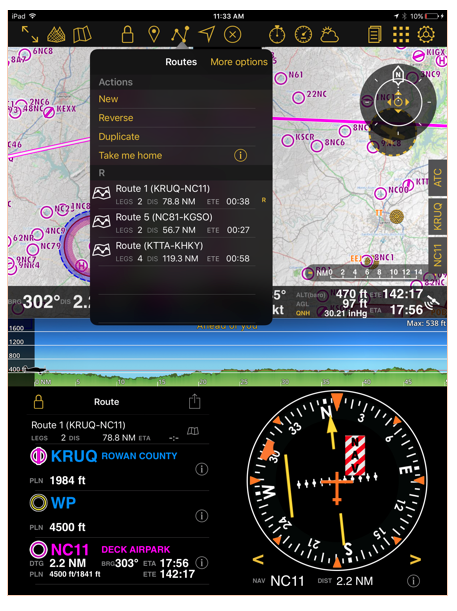 Being able to share your route information is another powerful feature that Air Navigation Pro provides. Perhaps you’re flying as a crew and want to share the route that you’ve planned with another pilot. Maybe you’re a flight student and want to share your cross country route with your instructor. 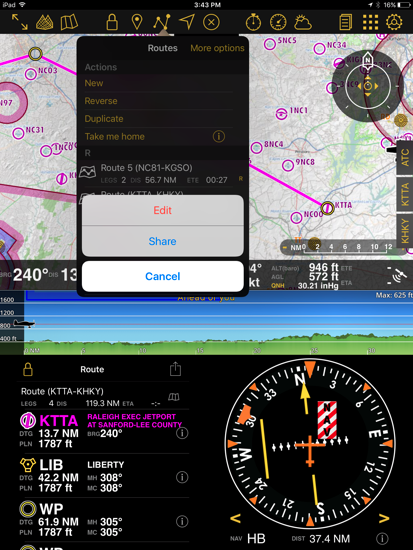 Whatever your situation, you can easily share your route information by simply airdropping it to another Air Navigation Pro user’s iOS device. To share the active route, first select the two arrows in the upper left-hand corner of your iOS screen. This will display the route and HSI information. Next, click the share icon that accompanies the route information at the bottom of the screen. This enables you to AirDrop your route to another iOS device. Good news! You can also share a route that is on your device that isn’t currently in use. Begin by selecting the routes icon at the top of your iOS device’s screen. Next, select More options and tap share. Once you select the route that you want to share, a yellow checkmark will appear next to that route. 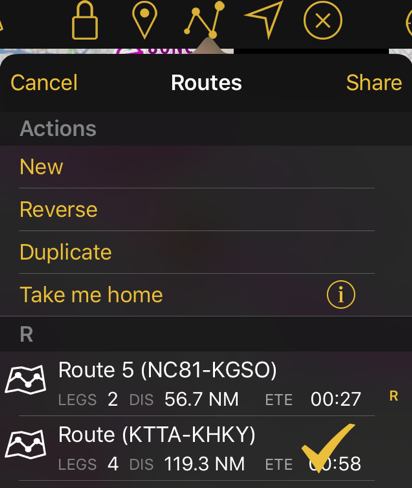 Click on Share at the top of the routes menu to air drop your route to another iOS device or even upload to your iCloud. 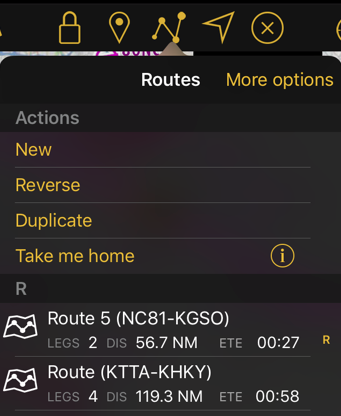 Not only is this a great feature that you can use to share route information with others, but it also makes it easy to transfer information between your various iOS devices. Sharing your aircraft profile information is just as simple as sharing your route on Air Navigation Pro. This is especially useful if you are a member of a flying club, attending a flight school, or if the aircraft you are flying is part of a fleet of aircraft. There is no need to reinvent the wheel and re-input data—if the work has already been done by an Air Navigation Pro user, you can share that information between devices with just a few taps on the screen. To share an aircraft profile, select the documents icon, and then select your aircraft. 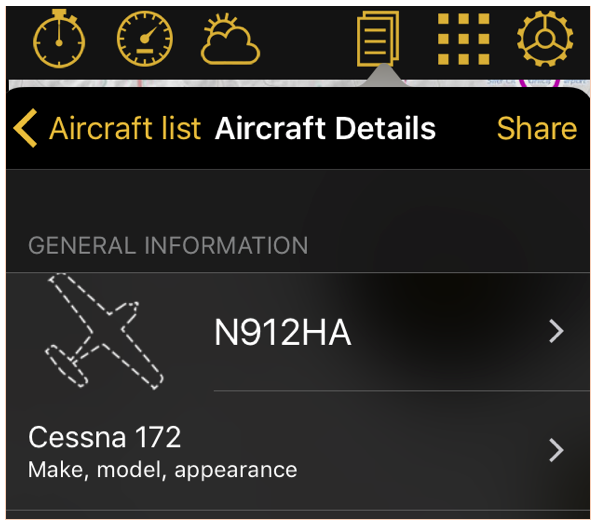 By tapping on Share, you can add your aircraft file to your notes, airdrop the profile to another device, attach it to an email, or even send the document to your iCloud. Sharing aircraft profiles cut down on the work and helps you get airborne faster! Once you’ve created a new route, you can make sure that you have it securely saved by uploading it to Air Navigation Pro’s servers. To save your route, select the tools icon at the top of the screen. Select Air Navigation Services and Routes Manager. 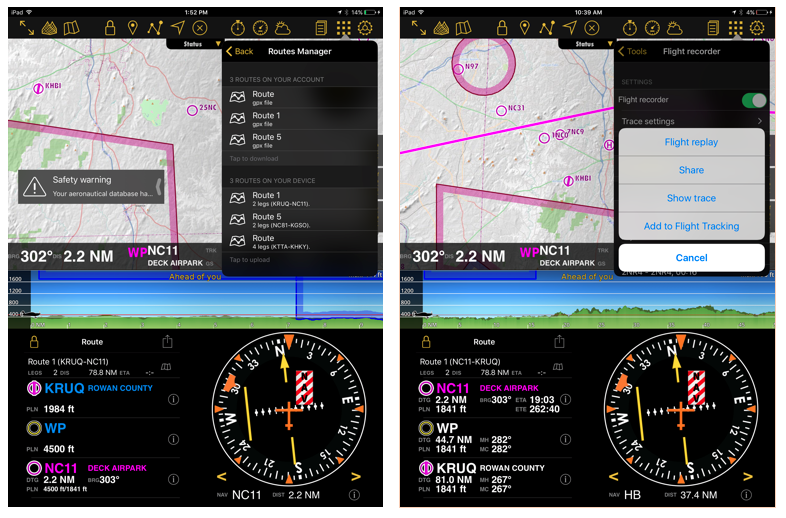 Simply tap on the route you want to save and add it to your Air Navigation Pro Manager. 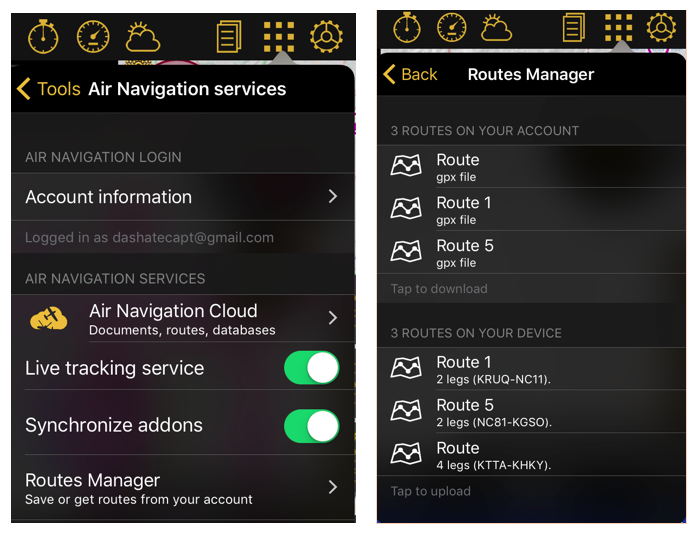 You can download routes from your Air Navigation Pro account just as easily too. Using the same Routes manager described above, simply tap the route on your account that you want to add to your device. What’s even better: Getting a new device doesn’t mean redoing all of your route planning work. All of your information is safe and secure with Air Navigation Pro account. Don’t forget, you can send your newly saved route to any Air Navigation Pro user. You can even send it via email from your device—just select the email icon from the share menu to email it. The days of trying to describe a point in space to another person using nebulous terms are over. In the past, sharing a location with another pilot meant drawing a circle on a paper map, providing a cumbersome latitude and longitude, or using a VOR radial and distance. 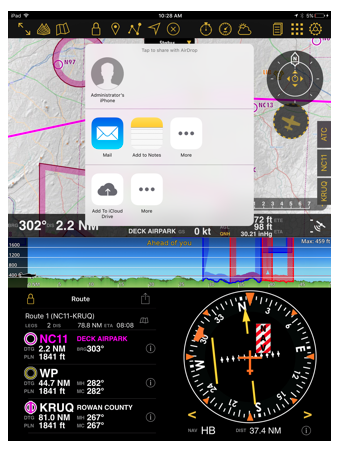 With Air Navigation Pro, you can instantly share any waypoint you create with another user with just a couple of taps on your iOS device. To share a waypoint with another Air Navigation Pro user, simply tap the waypoint that you want to share. Next, tap the share icon in the upper right-hand corner. Select to share the waypoint either as a .gpx file or send it as a Google Earth attachment. 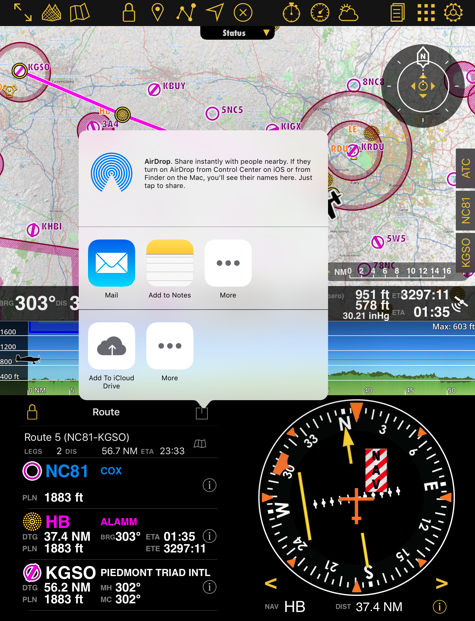 As with sharing routes and aircraft profiles, you have the option to email, airdrop it to another iOS device, or even save the waypoint information as a text file. 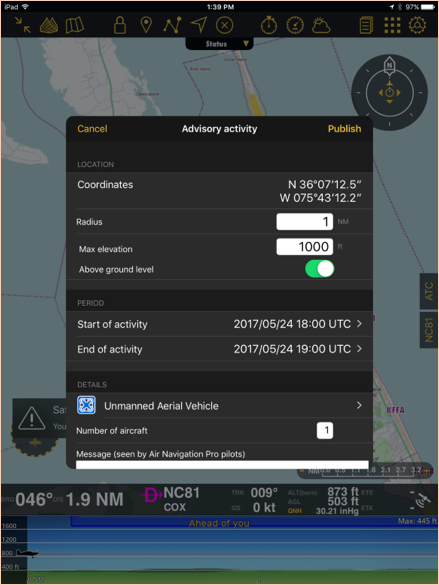 Whether you are briefing a student, sharing an interesting location with another pilot, or planning out contingency landing zones for helicopter operations, conveying accurate position information is easy with Air Navigation Pro. One of the joys of flying is sharing those experiences with others. There is a lot of learning to be found in sharing too; “hanger flying” sessions on rainy days allow pilots to gain valuable experience vicariously through the stories told by others. 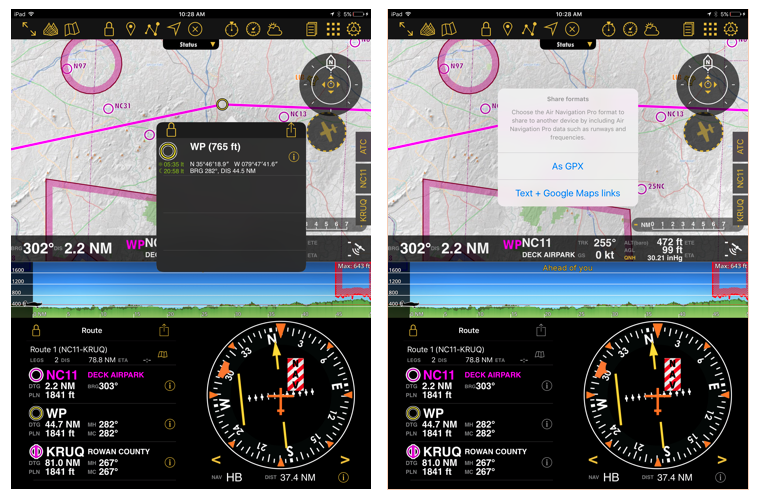 Air Navigation Pro makes that sharing even richer by allowing you to send recorded flight data to other users via AirDrop, email, or even upload your flight to Google Earth with a simple tap on the screen of your iOS device. 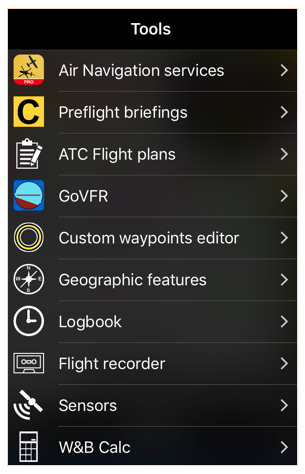 To share a flight, go to the Tools menu and select Flight recorder. Select the flight that you want to share from the recorded flights' list and tap share then select the format you want to use. Most flights are round trips—often returning to where you began your day. Instead of starting from scratch and planning a whole new flight, Air Navigation Pro allows you to reverse your original route using a couple of simple taps on iOS device. To use this time saving feature, simply tap the Routes symbol at the top of the screen and select Reverse. A new route that is the exact inverse of the original is immediately created. The only thing left for you to do is to select the appropriate cruising altitude for the direction of flight and you’re ready to fly! 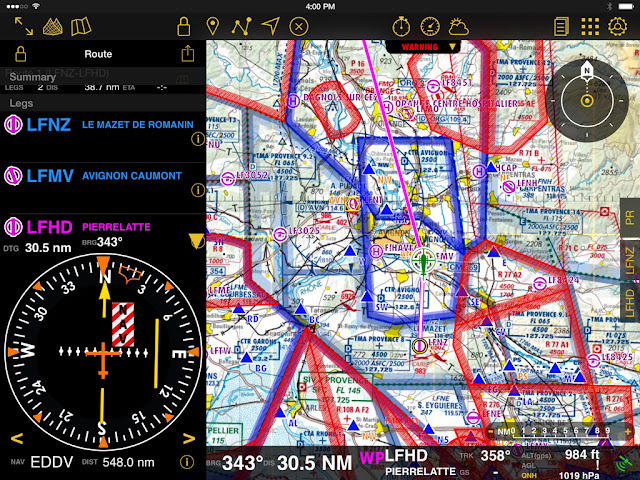 Accessing the right information with your fingertips is one of the most powerful advantages of Air Navigation Pro. An important component of the preflight information gathering process is obtaining a well-organized and competent briefing. By purchasing the Air Navigation Pro briefing subscription service, you can receive the most up-to-date NOTAM information from Skyguide right on your device. 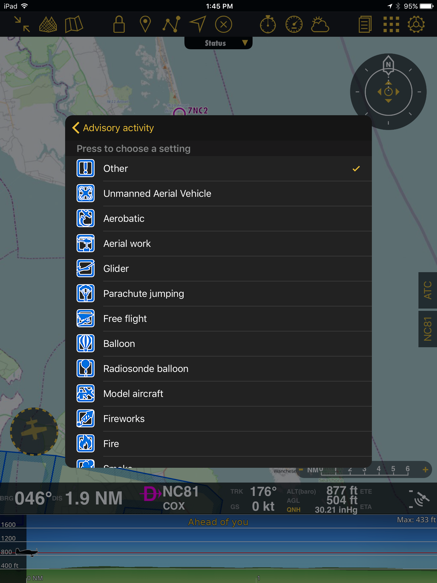 You can access preflight briefings from the tools menu, where you can display both the relevant NOTAMS and their radiuses right on your map display. No more worrying about whether or not you are really staying clear of active special use airspace or temporary flight restrictions. With Air Navigation Pro, you can see them relative to your flight path right on your device.